LOS ANGELES (KABC) -- "I have been privileged to share in your passion and love for this great game." 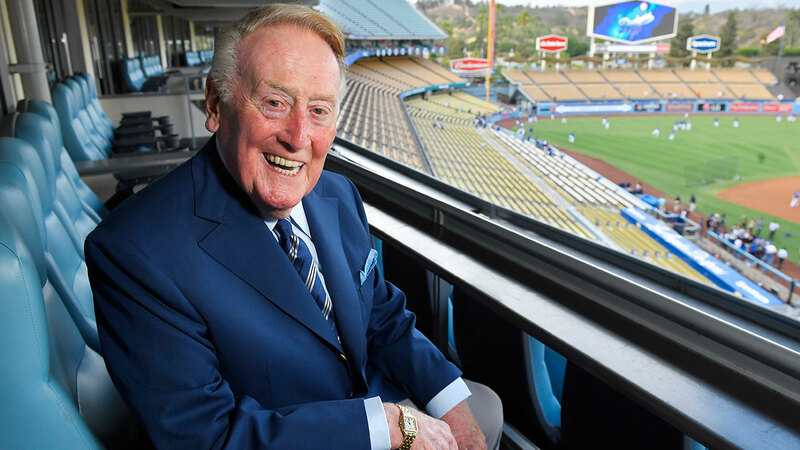 Vin Scully has penned a heartfelt letter to fans as he prepares to close out a glorious 67-year career. The letter is going out to 50,000 fans at Friday's "Vin Scully Appreciation Day" at Dodger Stadium. In it, he recalls first falling in love with baseball as a boy passing a window in New York to watch the World Series between the Yankees and the then-New York Giants on Oct. 2, 1936. Exactly 80 years to the day, he'll retire with a broadcast of the Dodgers season-ending matchup against the Giants in San Francisco. More giveaways are planned for Scully's final two games at Dodger Stadium this weekend. On Saturday, the first 50,000 fans will get a limited-edition Scully coin and on Sunday, the first 50,000 will get a special commemorative edition of Dodger Insider magazine. Angel Rodriguez wears body paint to honor Los Angeles Dodgers broadcaster Vin Scully at Dodger Stadium before the game against the Colorado Rockies, Friday, Sept. 23, 2016. His 67 seasons with the Dodgers - starting in Brooklyn - make him the longest-tenured broadcaster with a single team in any sport. "You were simply always there for me," Scully wrote. "I have always felt that I needed you more than you needed me and that holds true to this very day."